There is a passage in Acts 15 that I have read many times and never really took in what it was saying. I suspect there are many like me that have viewed this direction from the Jerusalem Council and never took the time to really study it out. 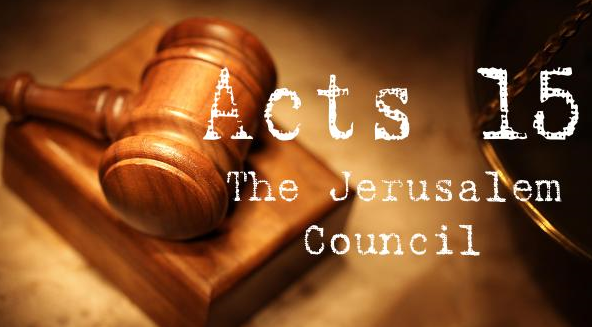 This article will explore what James and the Council in Jerusalem decided for new Gentile converts. First of all, who are Gentiles? It is usually taught that anyone who is not a Jew is a Gentile. Is that what the Bible tells us? The short answer is that Gentile is a term to describe someone outside of the covenant with YHVH. Many have chosen to cease being a Gentile. Gentiles, or ‘those of the nations,’ can choose to enter into the covenant with YHVH. At that point there is no Jew or Gentile, it is a matter of the heart. Once a decision is made to follow YHVH and enter into a covenant relationship with Him through His son, Yeshua, a person is no longer a ‘Gentile.’ They become a member of the Tribes of Israel, a grafted in branch of the Olive Tree. (see The Lost Sheep). In Acts 15, Paul and Barnabas were having a dispute with ‘certain men from Judaea.’ These men, otherwise known as the Circumcision party, taught the sign of the covenant (circumcision) was necessary for fellowship in the Synagogue. In order to address these men who were placing the ‘Law of Moses’ as a stumbling block in front of the new believers, Paul and Barnabas went to consult with the elders (James and the apostles), on how to resolve this dispute. Apparently there was a huge discussion among the elders and the apostles with a final ‘ruling’ by James (the half-brother of Yeshua). As we learned in Acts 10 and the story of Cornelius, how he and his household were filled with the Holy Spirit before they were baptized (Mikveh’d) or circumcised, the Council at Jerusalem understood that there is an order of operations when it comes to conversion. In essence, the obedience to the letter of the written law was not necessary to believe and receive the spirit. The caveat to that is that obedience to the Law of Moses was not abrogated, but placed in its appropriate place. First we believe; then we learn and obey. Does that sound like they didn’t want the Gentiles to learn the Law of Moses? Or is it more properly understood that there was a minimum requirement to fellowship in the synagogue while they learned Torah? What are the Necessary things? It is important to understand the context and culture from which the Gentiles were emerging. The population of Judaea, Samaria and elsewhere was heavily influenced by Greek culture. Pagan deities were honored (i.e. Temple of Diana/Ephesus). James and the elders determined that having one foot in idolatry and one in the synagogue was not acceptable. At a minimum, the new converts had to abandon the practices that were done in the pagan temples. Today we have little understanding or point of reference for what went on in a pagan temple. We have relegated that to the distant past, and see no significance in what it was the Jerusalem Council was concerned about. It is easy to read over the Letter to the Gentiles and think it does not apply to us. It is never taught in mainstream Christian Churches, and so we gloss over the ruling and go on our merry way. But, what James declares as the minimum requirement for entry into the synagogue (where Moses would be taught each Sabbath) gives us a clue to what Gentiles probably considered normal behavior. To all of you who have bought into the lie that the Law was done away with at the crucifixion and resurrection of Yeshua, it should be noted that this direction from the Jerusalem Council happened years after the event that is touted as the birth of the church. Apparently, the Council of Jerusalem still consulted the Torah and believed in its direction; which begs the question, why do we not do the same today? The irony of the letter to the Gentiles is that many today think that the Council let the Gentiles off the hook for Torah-observance. They only have to do these four minimum requirements to be followers of Yeshua! Even if that were true, and I doubt it, it is apparent that the church today doesn’t even adhere to these minimum requirements! I encourage you to read Leviticus 17 which details idolatry and the issues of strangled animals and blood. How does that apply to us today? Should we consider these directions as they apply to our diet? Even if you want to reject the instructions 1, 3 and 4, as inapplicable to us today, we simply cannot ignore #2. How does Sexual behavior apply to New Converts? We have been handed a judgment from the US Supreme Court saying that homosexuals may marry, and our society is embracing and encouraging gender confusion and adultery. How does this square with Leviticus 18? If you believe that the Council in Jerusalem used the Torah (specifically Lev 17 & 18) to write the Letter to the Gentiles, you must also understand that ALL of the prohibitions on sexual perversion enumerated in Leviticus 18 are still applicable for righteousness today. Read it! It is pretty clear. Do you remember when Paul scolded his congregation in 1 Corinthians 5? What did he instruct them to do? He told them to remove the person from their midst! He said, purge out the old leaven! Yet today there is no consequence for any sexual sin within the church, certainly not dis-fellowship! When is the body of Yeshua going to stand up and declare what the Minimum Requirement to convert to belief in Yeshua requires? It is time to draw the lines in the sand, just as Yeshua did when he was confronted by the group with the adulterous woman! Only the Law of Moses is in line with YHVH. Yeshua certainly understood this! The incident of casting the first stone that Christianity has construed to be abolishing the law is instead a perfect example of Yeshua following the letter of the Law. He didn’t abolish the law; he upheld it. Several Torah instructions would have been violated had he condemned or sought the woman to be stoned. He’d been asked (when he had no authority to judge as he was not on the Sanhedrin) to condemn her. There were not two witnesses. Only the woman was brought forth (when Torah says both who commit adultery are guilty and worthy of stoning). These are just some of the points that the crowd used to ‘trap’ Yeshua into doing something against the Law of Moses. If he had done anything to break Torah they could and would have been right to declare him a false prophet! Isn’t it time we understand the Letter to the Gentiles? absolutely blessed of the depth of revelations brought forward and Thank You. “no longer a gentile blessed my soul. New Covenant through Messiah, grafted into the Olive Tree. One in Yeshua. Thank you Julia Glattfelt, for setting the record straight so to speak. This is a very good well done study you did there. and just like the tittle i 🙂 shabbat shalom achoti ! Too many people read only what fits what they already have been taught as truth. Anything outside those lines is ignored. Well done.